The Olympic Games is a massively multiplayer event wherein local champions from various territories convene in a single geographic location to compete in a wide variety of mini-games within larger categories (aquatic, track, gymnastics, cycling, and others). Winners in each event acquire a gold medal. Second prize is a silver medal; third prize is a bronze medal. Fourth prize is the disappointment of everyone you love. The audience plays as well. They play the Olympics as a sort of gamified version of patriotism. The 2016 Olympic Summer Games in Rio de Janeiro, Brazil are over. We won’t have another Summer Olympics until 2020 in Tokyo. This means you have four years to decide if playing The Olympic Summer Games–as an athlete or invested audience member–is something you should consider. I’m here to help you with that. Welcome to the Kotaku Review of The Olympic Summer Games. Some set-up, for those of you who have not heard of the Olympics: each Olympic athlete represents a country. In order to achieve eligibility to compete in the Olympic Games, players must first excel on local, regional, and then national levels. This is a grueling process requiring training and obsession. The Olympics are a Matryoshka Doll of trainer-trainee relationships. The training process of an Olympic athlete requires a custom-built lifestyle. To excel, these athletes must compete, train, and/or contemplate their sport every day of their lives. They must eat strict diets. They cannot ever lose grasp of their inspiration. This requires the nurturing of a trainer. Proud parents push children to succeed. The child evolves, Pokémon-like, into an athlete, who now requires an expert coach. The athlete evolves into a champion, who requires a champion’s coach. Next, the champion becomes an Olympian, a representative of their nation and all their nation’s patriots. An Olympian goes to the Olympics and stands a slim chance of becoming a medalist: one of the three best in the world during this four-year cycle of human history. One sub-plot of the Olympic Games involves humankind’s struggle with time itself. Can an Olympian exit the Olympics, return to their nation, and then repeat the cycle of competition, qualification, and excellence? At this year’s Olympic Summer Games in Rio de Janeiro, we saw Michael Phelps and Usain Bolt each achieve this particularly improbable evolution. The Olympics favor players with access to great resources. The larger a conglomeration of such persons your locality possesses, the healthier the competition. Healthy competition pushes an athlete to be better (source: any interview with any athlete ever). It’s harder to compete if your nation isn’t rich. Living in a third-world country and aspiring to be an Olympic swimmer is like trying to become a pro Dota player over wifi, from your research lab in Antarctica, in a game where two of the players on your team are bots, and your PC stopped recognizing your microphone. The Olympics also places a historical framework of measurement on the limits of the human bodies which we are all trapped in all day every day even when the Olympics are not airing on television. They give us something to compare ourselves to, and we’re weirdly proud of ourselves even if we can’t compare. The Olympics present a neutral place for all world nations and cultures to participate in contests whose rules are objective and fair. This presents a major challenge to an art director: the arenas, venues, typography, logos, and trademarks must be culturally neutral, yet not at the expense of timeliness and taste. They must incorporate the flavor of the host city and country, though not to a degree which alienates other cultures. The graphics of the Olympics must present neutrality, balance, and majesty. It’s perhaps the majesty that is the most important: the Olympics must look big. This bigness in juxtaposition with the rarity of the event (every four years), inflates the omni-cultural worth of the gold medal. Yes, the proper artistic treatment can make a piece of gold worth infinitely more than its weight in gold. The Olympics lacks a variety of tracks. Mostly you’ll hear the same two over and over. John Williams composed one of these original tracks, and conducted the orchestra for the most popular medley recording. Most players choose to listen to their own custom soundtrack, however. For a lot of swimmers, for some reason, that’s Eminem. Well . . . okay! Billions of years ago, some meteorites collided with the planet Earth. They impacted deep into the crust of the planet. These meteorites brought with them a rare metal which was so shiny and so yellow that the most intelligent living things decided this metal possessed a value tantamount to magic. Today, the citizens of this planet call that metal “gold,” and it forms the basis for many ancient economic systems the ghost of whose design exists behind many curtains today. Later, yet still long ago, the people of Greece imagined a pantheon of gods whose combinations of supernatural powers and human flaws made for good educational literature. The literature crept into the Greeks’ reality, and they saw themselves worshipping a mountain. In the shadow of that mountain, as the literature had described, they staged a game contest in which naked muscular men competed to win a precious wreath. Throughout history “Gold” hid behind curtains of the wild subterrain, and eventually its presence was known, and there was no turning back. Now that its presence is known, the people make discs–a circle, the futile geometry of life–of this substance (mixed with silver), and bestow it upon those who by absolute lack of accident or mistake rise unto the stage as The World’s Best At This Exact Thing At This Exact Moment. Meanwhile, as the people stare in awe and wonder, what happens elsewhere in the world? What sinister plot awaits the moment of hatching? Are these games a distraction? Or is everything else a distraction? How high will the winners rise? And what will happen to the losers? The overall design of the Olympic Games has an absolute cohesion. The graphics represent the culture and historical majesty of the event, and such an important event is by necessity a rare occurrence. It happens only every four years. If you game over at the Olympics, you can’t continue for four more years. Imagine if the notoriously difficult video game Dark Souls had a boss where, if you die, you have to re-start the whole game from the beginning. No. Wait. Imagine if Dark Souls (Dark Souls Mention Counter: #2) had a boss where, if you died, you had to pay $60 to buy the game again, and it never, ever went on sale on Steam, and you’d only be able to challenge that boss once every four years. Also, that boss could one-hit kill you no matter what level you were on and no matter what armor you were wearing. And also, if you beat that boss, you’d immediately get a raise at work, or you’d be offered a job, or your crush would ask you out, or you’d suddenly get like really good at the guitar. Here, once again, the graphics, presentation, and story deepen the design. In an event like the 100-meter sprint, competitors race one another at the same time. They race in a series of heats, to determine the top best times for the final race. In the interest of impartiality, one might wonder, shouldn’t all of the racers race one at a time, with their times logged separately? Well, maybe you’d be right to wonder that. However, in order to maintain a massive, important historical legacy, the Olympics must, whenever possible, present an enduring spectacle. Two runners is more of a spectacle than one. Three is better than two. The math scales up. We all know that “number of characters moving on screen at once” has been a metric for reviewing video game graphics for as long as humans have had eyes. So too is it with many sporting activities. The first cavehuman to kick a coconut between two trees and scream “Goal” had a best friend whose first criticism was likely: “Maybe get some more guys out there”. If racers all raced separately, with their time being their final time, we wouldn’t need to race qualifying heats. Every run would be someone’s final run. But there are hundreds of runners. You can’t just run them all separately. It’d take all day. There’s no spectacle in that. You might criticize swimming similarly: in Olympic swimming events, the competitors exist in separate lanes. They are alone. They do not interact with their competitors. Well, here is where spectacle becomes design. Finally, spectacle, story, and history fuse to the player’s psychology. See this guy looking at Michael Phelps during the 200-meter butterfly swim race? Kaboom: That’s the guy who lost. With each event already pregnant with the moment, the history, and the spectacle, the Olympics goes one step further with yet another great feature: all-time leaderboards. Every so often, someone is going to break a world record. Thanks to our modern technology, television broadcasts of the Olympics can represent the world record as a visible graphic. If the winner is winning hard enough, the game offers us spectators an opportunity to cheer on something else. This modern user experience innovation was quite useful at the 2016 Olympic Summer Games in Rio de Janeiro whenever Katie Ledecky was swimming. The Olympics isn’t always about world records, however. You just need to be the best of all the people at the Olympics. It’s not about being the best ever: it’s about being the best right now. The Olympics is a state of the union for Who’s The Best Right Now. The depth of the meta-game is staggering: if a sprinter who might be faster than you gets food poisoning the night before the race, of course they’re not going to blame that when they lose, because champions don’t complain, though you’re going to wonder for four years. In four years, maybe neither of you will qualify. Maybe you’ll never know who can actually run faster. Maybe we never know anything about anyone. Maybe “the perfect circumstances” don’t exist. Maybe that’s the soul of the Olympics. The soul of the Olympics is Serena and Venus Williams, the greatest and most powerful athletes alive, owners of many titles, much acclaim, and legacies of endorsements, losing in round one of the Olympic doubles tennis tournament because Venus was dehydrated, because Brazil is frighteningly hot, to a team from the Czech Republic who only went on to win the bronze medal. Many events are objective (track, weightlifting, swimming, archery, fencing, cycling), and many of them are subjective (diving, boxing). Some of them are an eclectic hybrid of objectivity and subjectivity (equestrian, kayak slalom, judo). These events require judges, who score the participants on a scale which differs from contest to contest. Certain occurrences (touching the balance beam in gymnastics, for example) demand an immediate deduction of a few tenths of a point. In the case of these events, a first-time viewer might fail to immediately grasp the reasons some deductions are worse than others. To watch Olympic gymnastics is to ponder an infinitely impossible history in which committees and judges argued and compromised to settle on exact point values. The certainty evident in the enthusiasm of the utter professionals announcing the contests on broadcast television boosts the uninitiated’s confidence that these subjective contests are at least fair. However, sometimes the commentary lacks depth. For example, the commentators on Olympic judo seem to not ever be clear on the rules. Wikipedia describes an “ippon” (the highest score in judo) as “a technique which is judged as decisive, this is usually a move which connects cleanly, with good form and with little opportunity for the opponent to defend against it”. Notice the use of the word “judged” in there. “Judged” how? The American commentators for Olympic judo never tell the viewer what to look for: they’ll just say, “Only sixty seconds left”, or such. This sort of fuzzy design abounds in many Olympic sports. You might have to read a book or post on Reddit to understand some of this stuff. Once you’ve competed in the Olympics, you face a new chapter. Did you win? That’s great. Maybe you’ll never win again. Did you get a silver medal? That’s good. Will you continue, and try to get a gold? Maybe you will continue, though you probably won’t ever get the gold. Olympic sports require human bodies. These are the best players in the world at their respective sports. These are the best human bodies in the world for performing these respective sports. Bodies eventually age in the direction away from sports. The odds are against any one participant winning at all, much less winning multiple times as their body ages toward oblivion. Sometimes, this ethereal game design births a miracle our history-math has not prepared us for. It happened this year: Usain Bolt claimed a gold medal in the 100-meter sprint for his third Olympics in a row. No one has ever done this. Endless parades of analysts cannot conclude why or how this happened, nor can they theorize when it will ever happen again. Like the gold of the medal itself, this is a plot twist that comes from space, out of nowhere. We have been talking about it for a week, and we will be talking about it for far longer than that. The same day he earned his third gold medal in three consecutive Olympics, Usain Bolt announced he would not run in the Olympics again. He knows he would lose in four years. Yet at that moment of his victory, there was no one faster. Like a true hero, he is ready for the antagonist– human aging, history itself!–and he does what he must do. All Olympians age and retire. What does the hero do? Does the hero return to their nation to inspire their people, to train future champions, to buff their nation’s confidence? Do they accept endorsement deals and get rich? Does the hero become a coach, working directly with the champions of the future? And what of the abandoned Olympic venues? What of the cities that hosted the Olympics? Did the freakish expenditure of billions of currency units result in a positive impact on the local economy? Not really. I wrote capsule reviews of all of the Summer Olympic events. I won’t dare publish the whole thing. You’d need a shower if you read it. I’d need a shower if you read it. I’ll give you my top seven. Kayak slalom is insane nonsense inside of an elaborate current pool full of waves and artificial waterfalls, inside of which the level designers have situated multiple gates, some of which the player must navigate through forward, and some of which the player must backtrack into. Of all these events, individual kayak slalom is my favorite. It’s the Super Metroid of Olympic Sports. It’s got mechanically technical motion, and it’s got backtracking. Also, when just one rower is in that kayak, with all those waves surging around them in a nature-like pool within a mechanical man-made arena, it gives the visible impression of a person gifted with a bizarre machine-body alone in an unforgiving artificial wilderness habitat. Two teams of two players each play volleyball on a sandy beach. This is the best volleyball. Beach volleyball is wonderfully easy to spectate, because it’s just two players per side. The most casual observer can spot holes in a team’s defense. You can see two players begin to move too close to one another, seconds before the other team kills the ball onto a spot their opponents weren’t covering. For whatever the reason, the US women’s beach volleyball team of Kerri Walsh Jennings and April Ross is incredibly dominant. I watched their matches this Olympics with great interest. During one match the commentator mentioned that they had lost only one of 53 sets in Olympic competition. That’s insane. It kind of makes me wonder if anyone else has read the instruction manual. Watching another team lose to them in beach volleyball is like what it’d probably look like if my mom played Call of Duty. In Rio, in the true spirit of the Olympics, Walsh Jennings and Ross lost their first-ever game to the Brazilian team. They got the bronze medal. Olympic fencing is definitely the most e-sports of Olympic Sports. The players wear weird face-covering helmets, some of which have their countries’ flags painted across the screen. On the players’ helmets and on either side of the arena runway are bright LED lights which come to life in a color to match the fencer who just scored a point. The fencers wear suits full of electric sensors. In some cases, the sensor is in the sword. The swords themselves are weirdly floppy, spindly things. Fencing is a competitive physics puzzle: use your unpredictably floppy blade to block your opponent’s unpredictably floppy blade. All the while, insinuate the tip of your sword into contact with your opponent’s body to score points. This game involves metric tons of bluffing and body-language-reading. It certainly doesn’t let you look your opponent in the eye, and that’s part of the cold, bizarre, futuristic charm. Of the three Olympic varieties of fencing, épée is the most exciting. Unlike foil fencing, where only your opponent’s torso is a target, in épée you can score a point by touching your opponent anywhere. I will never pretend to be a fencing expert, though this accessible design makes this variety easier for me to watch and enjoy. Also, for added juicy complexity, the blade is shorter and heavier than a foil. Judges or referees are barely necessary, since electric sensors determine all the points, though slow-motion replays are still endlessly fascinating. A gymnast runs at a springboard, jumps onto the springboard with her hands, springs upward, flips onto a platform, and then pushes up with her hands, rocketing into the air. She flips anywhere between one and two million times in the air, and then lands. Judges scrutinize every aspect of this action. Prior to jumping, the gymnast declares which twists and tricks she will do in the air. Each trick has a predetermined degree of difficulty, which weights the maximum possible score for the vault. Failure to achieve perfect form in any aspect of the vault results in deductions. The easiest fault for a beginner to spot, as in all gymnastics events, is in the landing. Maybe the gymnast almost falls backward, or maybe her knees touch the mat. This is my favorite gymnastics event because it is decisive and to the point. It combines all the athleticism of every other gymnastics event into one smooth, incredibly impressive action. Failure and success are easy for even the uninitiated spectator to observe. A human runs toward a bar and jumps up and over it. They must not knock the bar off of its perch. For many centuries, we, the human race, didn’t know, realize, or otherwise deduce that the best way to jump over this bar was backward. That’s just the way our leg muscles and our knee-hinges work. It went from an idea to a fact: now everyone jumps over the bar backward. You’d be an idiot not to. The rules of the high jump do not demand that the player land on their feet. So they land, on their back, in a big pillowy mat. The butterfly is the second-fastest swimming stroke, after the front crawl, and it’s also easily the weirdest, stickiest, and most frictive of swimming strokes. Swimmers throw both arms, together, in front of their heads. They crash two bladed hands into the water. They pull the hands backward simultaneously in perfect coordination with a feet-together dolphin-kick of the legs. The butterfly swimmer must conduct their entire body like an orchestra. This is a beautiful, fragile, bizarre act of sports. I dare say it is the most mechanically intricate mobility action in the whole pantheon of sports. It’s even weirder than ice-skating. I consider the 100-meter butterfly the most interesting swimming event. It’s the shortest race in that stroke. This race has the most potent combination of speed and stroke-violence. At any distance, any racer (whether swimming or running or biking) is going to have to know how to understand and measure the exact limits of their energy, and know how and where to spend it. The 200-meter butterfly encompasses four laps of a 50-meter pool. The 100-meter race is just two. That’s punchy. That’s my kind of level design. Running as a sport is our most fundamental human contest. Without the assistance of a bicycle, a car, rollerblades, or hang-gliders–with no more than a pair of shoes–a group of humans wonders which of them can get Over There first. Olympic Running comes in many varieties. We have a marathon of 42.195 kilometers, which takes hours, and we have a 100-meter sprint during which competitors will run with the speed of a dead body falling off a cliff. During a 100-meter race, a sprinter might not take a single breath. Of all the races, I adore the 400-meter. This is the shortest race that requires all of a runner’s energy. 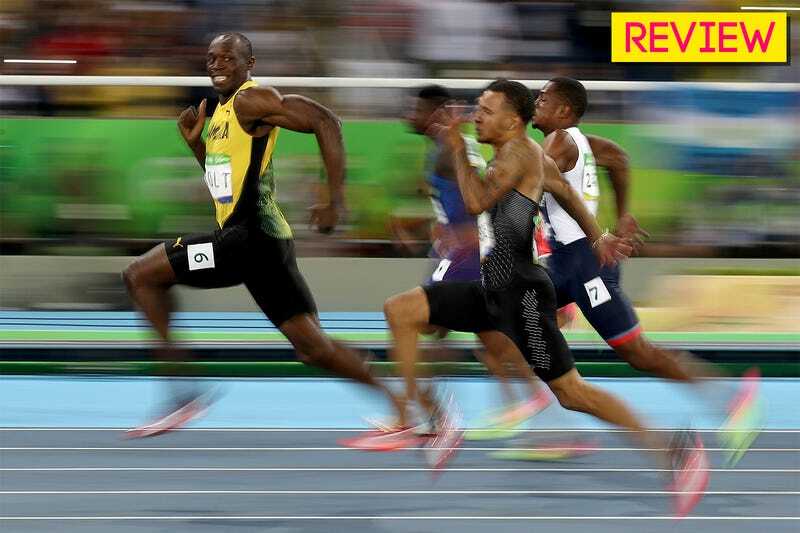 Don’t get me wrong: a 100-meter or race is an excellent race, and Usain Bolt is a champion of impossible quality. However, a human body simply can’t expend all of its energy in the time it takes to run 100 meters, unless you’re me when I get back from Christmas vacation! Mom’s cookies, you know what I mean! You can, however, use all of your energy running 300 meters. This means that, for an interesting contest, 400 meters is the sweet spot. The worst that can happen in a 400-meter sprint is that, upon losing in last place, you don’t even feel the need to immediately lie down on your back and hyperventilate. Notice that runners of a 100-meter sprint continue to run, taking a victory tour. At the end of a 400-meter sprint, everyone is done running. It isn’t uncommon for many runners to fall onto the track to recover. This is the best of running events, in which the participants squeeze all of the desperation of a marathon in less than a minute. Also, you can dive over the finish line and still win. DISCLAIMER: I watched the Olympics for free on NBC in NYC in the USA. While watching, I witnessed many Coca-Cola commercials. I drank two Coca-Cola Zeroes while writing this. They were good.